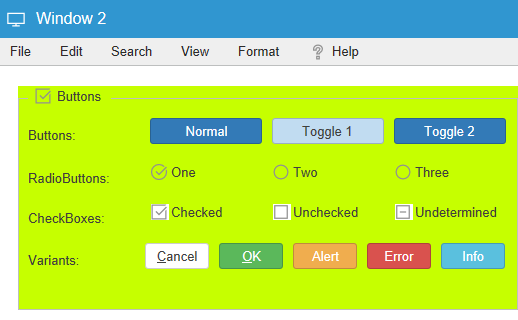 In the attached pics is a checkbox in a TableLayoutPanel with blue background color . The first time it loads, the checkbox is also filled with blue. After check/uncheck the blue color goes away. Is the first blue state related with a null (unknown) value, i.e. ! (checked | unchecked), or just a wrong background ? Some frameworks have this unknown value indicated by a greyed out checkbox, but this can be easily confused with a disabled checkbox… May be a question mark in the box would give the unknown status. And consecutive clicks rotate between the three values (unknown/checked/unchecked). I can’t reproduce the second state (white background). The checkboxes use svg images from fontawesome, icons-8 and google material and the inner section is hollow. It should always show the background behind it. We can force the background of the icon widget only to be “@window” (usually white). See attached screenshot of how it would look like. About the three state checkbox, Wisej checkboxes are two state by default. You can enable the three state mode using using the checkBox1.ThreeState property. In that case clicks cycle the three states. The Checked property would still be true when checked and false in all other cases. You can retrieve/set the Indeterminate state setting checkBox1.CheckState.